Low prices. OrangeSmile.com offers car hire service in Bosnia And Herzegovina on the lowest-rate-guarantee basis, since we work with car suppliers directly. For your search criteria in Bosnia And Herzegovina, we always select and show the best rental offers. The car reservation process consists of 3 simple steps: (1) search for available cars for your dates in Bosnia And Herzegovina; (2) select your car type; and (3) fill in the booking forms. Once the reservation is completed, you will receive a confirmation voucher to your email address. During the booking process, please check your rental conditions. To pick up your car at the rental point in Bosnia And Herzegovina, you need to provide our confirmation voucher, your driving license and a valid credit card. The final payment is normally carried out at the pick-up point. Our car hire points in Bosnia And Herzegovina accept VISA, MasterCard, etc - please check your rental conditions. At the pick-up point, please read the handling manual and check the car for present defects. 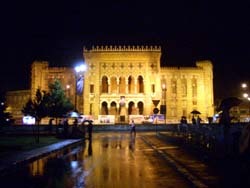 OrangeSmile.com wishes you a pleasant journey to Bosnia And Herzegovina! The car hire reservation system OrangeSmile.com allows renting a vehicle in Bosnia And Herzegovina within 10 minutes. Our largest database of car suppliers enables us to provide you a rental car in Bosnia And Herzegovina at the cheapest rate ever possible. At rental locations in Bosnia And Herzegovina we offer the following car sizes: mini, compact, economy, standard, premium and luxury. The following car types are available in Bosnia And Herzegovina: Sedan, Hatchback, Jeep, Cabriolet, Coupe, Minivan and Minibus. Mostar is an unofficial capital of the country. The city is rich in places of interest; there are many old churches and historic buildings there. However, Stari Most (Old Bridge) remains the signature landmark of Mostar. The building of the bridge took place in 1566 under command of famous architect Mimar Hayruddin. The bridge is 20m high and is considered one of most famous constructions of its era. The bridge was severely damaged during the war with Croatia. Besides the Old Bridge, several hundred churches were destroyed in that war, so now only ruins remind of once magnificent sanctuaries. Tabacica Mosque is another famous landmark of Mostar. The mosque dates back to 1600. It was also damaged and later reconstructed precisely by local architects and builders. Nowadays, car rental areas in Bosnia And Herzegovina are often located outside airport terminals. In this case just take a free-of-charge bus from the airport to the rental area.